A beautiful 8" diameter bone china plate with the child's name and communion date hand detailed in platinum (silver) is finished with two platinum lines and laurel detailing. The venue may be added as well. A maximum of 25 letters is allowed for the child's name. This plate is the perfect communion commemorative. A beautiful 7" x 5" frame to showcase that special communion day photo. 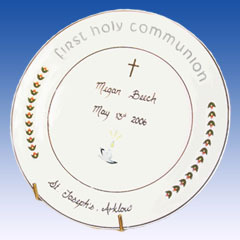 The child's name and communion date are hand detailed in platinum (silver). A maximum of 20 letters is allowed for the child's name. 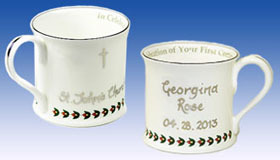 "In Celebration of Your First Communion" appears inside the rim of the cup and finished with hand painted brushwork to the handle & edges. 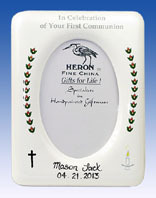 The child's name and communion date are hand detailed in Platinum (silver). The venue is shown across the reverse side of the cup. A maximum of 25 letters is allowed for the child's name. The Cup is 3" high.